*The research for this blog post contributed to a paper The Liminal Wilderness of Railway Margins that I delivered on June 27 2013 at Cultures of the Suburbs. The ‘Cultures of the Suburbs International Research Network’ is a partnership between the Universities of Exeter and Kingston (UK), Witwatersrand (South Africa), Hofstra (USA), Griffith (Australia) and the National University of Ireland, Maynooth. Its purpose is to support scholarly activities relating to the cultural life of the suburbs. The Symposium at Hofstra University New York was funded by The Leverhulme Trust. Sit opposite a fellow commuter in a suburban train and you will notice that when they look out of the window that their eyes flick rapidly back and forth in an uncanny, robotic manner as they follow the passage of the surrounding scene. This characteristic pattern of eye movement is well known amongst vision researchers as opto-kinetic nystagmus. Coined in the mid-eighteenth century (Macbride 1772) from the Greek nustagmos ‘nodding, drowsiness’; nystagmus can be a debilitating syndrome caused by disease or medication and it can result in nausea and dizziness because of the cross-stimulation with the vestibular system and sense of balance. Opto-kinetic nystagmus, with which we are concerned here, occurs when the whole visual scene moves, as happens when looking out of a window in a moving vehicle; indeed, the effect was once known as ‘railway nystagmus’ for this reason [see Journal of Nervous & Mental Disease: March 1923 – Volume 57 – Issue 3 – ppg 291-292]. You can test for yourself the ways this eye-movement is semi-voluntary, and can result from attending to the moving scene, or conversely how it can be an automatic response which will cease if you turn your attention to inner thoughts or to another sensation. If the velocity of field movement increases above around 30°s–1, the eyes lag progressively behind, and maintaining steady fixation on the object is less effective, so details of the cutting which is speeding by only metres away from the train window become difficult to see clearly. During the rapid saccades in the intervals between the tracking/panning motion we are temporarily blind because they occur too fast for the retinal nerves to register, so inherently there is a freeze-frame quality to the visual effect. However fleeting, this fixation enables the individual to gather impressions, snapshots of the landscape, which may remain in short-term memory and even be summoned up later. This is of interest to me as a photographer. Montage of views on one trip Castlemaine to Kyneton, Central Victoria. I have been photographing from train windows for nearly ten years trying to duplicate in still images the qualities of this kind of rapid perception with the changes in concentration entailed, and the effects on attention. I regard the resulting images as containing signs of awareness and consciousness, or the suspension of it. The works from Vortex I exhibited in 2004 are panoramic panels that montage moments at which the eye ‘catches’ on natural details in journeys through the Central Victorian landscape. The opposite view, from outside the carriage became a new interest in a situation where there was nothing to see from inside. The mural scale (3.5 metres) work ‘Circle’, 2008, was sourced from digital photographs made looking into train carriages at stations in the London Underground. In this work, the circle is associated with the orbit of the commuter that bends around the twin poles of home and employment, work and rest, circulating in an ellipse around the ‘Ideal Life’. Each traveller’s path is a braid woven through gyrations of force and resistance. Optic flow, emulated with the panning, rotating lens tracing the moving subject, makes this visible. After May 2011, on taking up a position at Deakin University, I have been commuting to Melbourne, like so many fellow country-dwellers. After years of relatively quiet short-distance travel between regional centres, this commuting was manic. I became conscious of the ‘tyranny of distance’ psychologically impacting on me and on my fellow travellers, which is confirmed in the literature. In 2006 environmental psychologists Gary Evans of Cornell and Richard Wener of Polytechnic University report on their study of 208 commuters, taking trains from New Jersey to Manhattan. The researchers drew their conclusions after measuring commuters’ saliva for the stress hormone cortisol, analyzing questionnaires filled out by the commuters and their spouses and asking each participant to proofread a document at the end of the commute. Lily Hirsch and Dr Kirrilly Thompson of University of South Australia in 2011 published a study ‘I can sit but I’d rather stand…’ detailing experiences and perceptions of crowding on trains by commuters across the five metropolitan railways in Australia which included anecdotal accounts of avoidance techniques and interactions with fellow passengers. 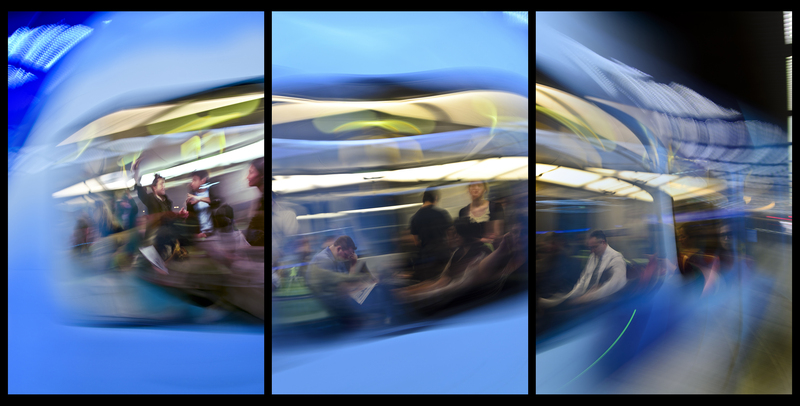 Im/mobile, six display-size (2150mm H x 4350mm W) light box installations exhibited in two cycles of three, develops imagery of train passengers photographed using this panning technique that ‘dissolves’ the vehicle and reveals the temporary human interactions in the state of transit. It was site-specific in the context of public 24-hour outdoor light box display White Street Projects which is in the Frankston Station precinct in Melbourne, Australia. In terms of public Melbourne commuter transport particularly for the passengers on the Frankston line, the longest in the Metro suburban rail network, it is a window into the demographic and the social relations of suburban Frankston. Passengers are absorbed now more deeply in their electronic devices than they ever were with their newspapers, but though they do glance occasionally out of the window, what is the point when they traverse this section of the Met twice daily, every working day? 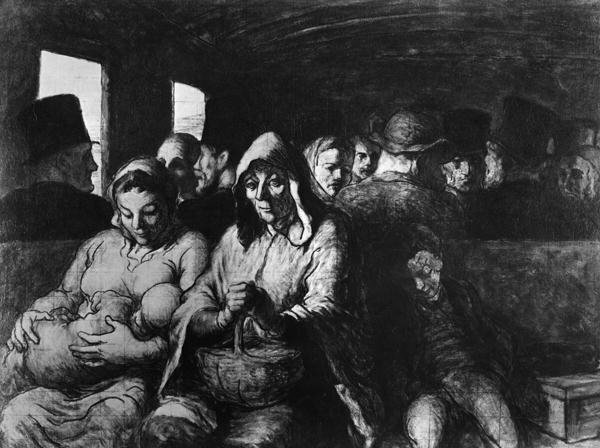 Hirsch and Thompson’s observations of strategies of avoidance are at play as passengers react to the crowding and alienation. It is quite the opposite of my experience of casual, friendly, regional travel. Photographing in these situations I am wary of intruding on personal space, but no-one seems to see me taking photographs, so pervasive is their deliberate shutting-out of their surroundings. What is recorded in ‘Second Nature’ is this absence of interaction between passengers. Isolation is something Wolfgang Schivelbusch notes in The Railway Journey as a developing phenomenon after the camaraderie of communal horse-drawn coach travel and the rowdy sociability of the Victorian-era third-class rail carriage (as recorded particularly in France by social-realist artists such as Gustav Doré, Honoré Daumier novelists and Alphonse Daudet). But what is the fleeting travellers’ intuition of a fugitive natural domain through which they pass? On the margins of railway corridors exists a liminal wilderness. Tossed or flowing over rickety, neglected fences backing onto the line, arriving in the craws and crap of birds, in flight, like the commuters themselves, come wild escapees from the domestic subjugation of gardens. Here we find a biota and vegetation succession that is largely uncultivated, but rich. In fact many (Kowarik, 1995; Tikka et al., 2001; Zerbe et al., 2002) argue that the ecological value of such sites improves after a few decades of being in a neglected derelict state, mainly determined by the spontaneous development of biotopes, leading to great biodiversity in flora and fauna. Although urban landscapes are strongly fragmented (Stenhouse, 2004), and transportation networks are mainly considered to be barriers for connectivity (Jackson and Fahrig, 2011) or corridors for invasive species (Brown et al., 2006), in urban landscapes, railways ensure structural connectivity (Calabrese & Fagan, 2004) because their vegetated edges penetrate into dense urban areas, similarly to rivers or to some roads. Despite their potential for connectivity in an anthropogenic context, their functional connectivity has been poorly studied (but see Tikka et al., 2001), and most studies focus on invasive species (Hansen and Clevenger, 2005). Penone et al. conclude that there is potential for railway edges to act as corridors. In particular they encourage the spread of common grassland plants, but, contrary to expectation, not noxious weeds. They conjecture that railways, of which there are more than a million kilometres worldwide, can become green networks to improve connectivity in urban landscapes, contributing and improving biodiversity in urban environments. We know from the case of the Chemin de fer de Petite Ceinture, Paris, that railway lines if left alone quickly revegetate, and they repopulate. Extending around a circular loop within the fortified walls of Paris this abandoned railway once connected the city’s five main lines. Completed in 1852, partially abandoned since 1934 and completely silent for the last few years, the tracks and several stations remain intact, though its future is the subject of ongoing debate. . 23 kilometers long; approximately 75 meters wide on average; tunnels occupying 12.6 kilometers of its overall extension; it is a considerable part of the city of Paris, and yet the unrestored portions of the Petite Ceinture remain unknown and officially out-of-bounds to most Parisians (Bretelle 2009). But human uses abound and some rail tunnels lead into the caves and passageways of the city’s famous catacombs, where subcultures meet and ‘illegal’ immigrants and youthful runaways hide (Foster 2006). Notably this abandoned line is the location for Chris Marker’s homage to the Lumiere Brothers. His 1994 triptych of video haikus includes Petite Ceinture; his centenary homage to the early Lumiere Brothers’ L’arrivée d’un train en gare de La Ciotat (1895), comprising solely of a fixed camera take of a vacant section of the line. La Paranthèse Urbaine : Circle is an approx. 5 minute stop-motion film by French photographer Jipé Corré over 2 weeks in spring 2009. Comprising 2633 mostly black-and-white photographs shot at regular five metre intervals from a crouching position, montaged into a moving image at 8 images/second. They provide the viewer with a journey around the Ceinture, not unlike (and probably in homage to) Georges Meliès’ 1898 Panorama pris d’un train en marche, partly shot along parts of the Ceinture (Strohmayer & Corre 2012). It is the Sentier Nature, along a portion of the Petite Ceinture in the elite 16th arrondissement (adjacent to Bois de Boulogne) that is the showcase ‘natural’ space and the ‘safest’ stretch of the entire line, inhabited by 200 species of plants, birds and butterflies, most of which are not to be found elsewhere in the city. Starting at Porte d’Auteuil Metro (line 10) the walk stretches for a mile, finishing up at the Restaurant de la Gare near La Muette Metro and Balzac’s house off rue Raynouard. The contrast of the Promenade plantée (an extensive green belt that follows the old Vincennes railway line), or the Sentier Nature with the rest of the Petite Ceinture, in its indeterminate state of ‘wilderness’ and danger, is instructive. This ‘civilizing/naturising’ impulse for abandoned railways is imitated in other parts of the world in the non-profits Rail Trails Australia and the American Rails-to-Trails Conservancy (RTC) that transform unused rail corridors into rail trails, like Melbourne’s Outer Circle Rail Trail (18km), or the preservation of the elevated 9th Street Branch [“Reading Viaduct“] and City Branch rail cut of the former Philadelphia and Reading Railroad and, of course, New York’s Chelsea High Line, the linear park built along a mile-long elevated railway, that has become the toast of Manhattan. Brown, G.P., Phillips, B.L., Webb, J.K., Shine, R., (2006). Toad on the road: use of roads as dispersal corridors by cane toads (Bufo marinus) at an invasion front in tropical Australia. Biological Conservation 133, 88–94. Calabrese, J.M., Fagan, W.F., 2004. A comparison-shopper’s guide to connectivity metrics. Frontiers in Ecology and the Environment. 2, 529–536. Currie, G. (2010, p.36), in “Quick and effective solution to rail overcrowding: free early bird ticket experience in Melbourne, Australia.” Transportation research record 2146(1): 35-42. reports that Melbourne‟s train ridership has increased by 43% from 2005-2010. Hansen, M.J., Clevenger, A.P., 2005. The influence of disturbance and habitat on the presence of non-native plant species along transport corridors. Biological Conservation. 125, 249–259. Herschel, J. F. W. (1833). A Treatise on Astronomy London: Longman. p.13. Jackson, N.D., Fahrig, L., 2011. Relative effects of road mortality and decreased connectivity on population genetic diversity. Biological Conservation 144, 3143–3148. McArdle, J. (2008) “Shifting Ground in some Australian Photography” In Mehigan T. (Ed.) Frameworks, Artworks, Place: The Space of Perception in the Modern World, Amsterdam ; New York : Rodopi. ISBN: 78-90-420-2362-8. pp. 67-82. Macbride, D. (1772) A Methodical Introduction to the Theory and Practice of Physic. London. W. Strahan, T. Cadell. –earliest mention of nystagmus, defined here as ‘involuntary movement of the eyelids’. Schivelbusch, W. (1986). The railway journey : the industrialization of time and space in the 19th century (New ed). University of California Press, Berkeley, Calif.
Tikka, P.M., Hogmander, H., Koski, P.S., 2001. Road and railway verges serve as dispersal corridors for grassland plants. Landscape Ecology. 16, 659–666. Zerbe, S., Maurer, U., Schmitz, S. & Sukopp, H. (2002). Biodiversity in Berlin and its potential for nature conservation. Landscape and Urban Planning, 62, 139-148. James McArdle recreates the fleeting travellers’ intuition of a fugitive, lost garden in occupation along the margins of railways and highways. Hi Erin, yes there is so much more one could add to this post – Walker Evans’ and Bruce Davidson’s subway pics of course, Kertesz’s fabulous De Chirico-esque pic of the steam train on the viaduct and Michel Pavlou’s fast shuffling, sliding, shifting, interfolding ‘Interstices’ @ http://vimeo.com/59419596, Adam Magyar’s pressed-to-the-glass portraits…and so many more…also now your Semaphore!